This unique pillow helps to lift and minimize pressure on the heels. It is covered in nylex for easy cleaning and filled with polyfill. This combination helps redistribute pressure of the patient's calf over the entire surface of the pillow, while comfortably lifting the heel off the bed surface. A padded strap, with hook-and-loop closure, holds the leg in place. Wipes clean with warm, soapy water. 2 PER CARTON FREE SHIPPING-- product ships direct from manufacturer average lead time 1 week. 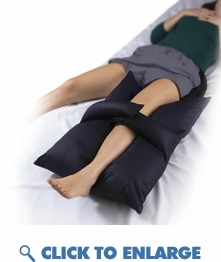 This unique pillow helps to lift and minimize pressure on the heels. It is covered in nylex for easy cleaning and filled with polyfill. This combination helps redistribute pressure of the patient's calf over the entire surface of the pillow, while comfortably lifting the heel off the bed surface. A padded strap, with hook-and-loop closure, holds the leg in place. Wipes clean with warm, soapy water. FREE SHIPPING-- product ships direct from manufacturer average lead time 1 week.